Do you have your basketball bracket filled out for March Madness? We love a good bracket too, especially when it comes to narrowing down the best features of comfortable bedding. We’re talking about Mattress Madness, which can help you score the best memory foam mattress in the league. Better sleep means better living. Could it also mean better instincts about who’s making it to the Elite Eight? We’re not making any promises, but probably. When you’re on the right mattress, you can wake up each morning feeling stronger and thinking clearer. We’ve put together a bracket of common mattress qualities. These features are found in the most popular brands. Who will win and who will lose? We think Layla Mattress has got this trophy on lock, but let’s find out once and for all. Deciding what the “best” mattress features are is somewhat subjective. But then again, we’re kind of the experts on this type of thing. We’ve pitted eight of the biggest deciding factors against one another in the first round of our Mattress Madness bracket. Does the inside of your mattress have the right support? Does memory foam really have the upper hand? A memory foam mattress brings a lot to this match: it conforms to your body, bounces back when you get out of bed, and reduces those painful pressure points. Innerspring mattresses have a layer of cotton or wool filler to add to your comfort. They, too, may be able to relieve discomfort at common pressure points like your hips and knees. However, springs don’t conform to your body and they can break over time. So, which is better: the best memory foam mattress or a spring-filled model? Top-notch memory foam meets the breathability and comfort of a traditional mattress and beats in its pain management and longevity. The best memory foam mattress is hard to beat. We all have our firmness preferences. Some people love a smooth, firm mattress, and some of us like a more forgiving surface that conforms to our curves. But which wins out in this bracket? Body conforming mattresses support your hips and shoulders equally. Plus, other points of potential importance – like your sides and knees – aren’t left in the dust. Mattresses that focus on evenly supporting and protecting your body promote pain-free sleep. The best memory foam mattress options compete in this category. Super-firm mattresses can be OK for side sleepers, but they don’t offer a ton of spine support. If you’re a back sleeper, a conforming mattress is also gentler on your body. Even for sleepers who like a firmer feel, a focus on support is essential. 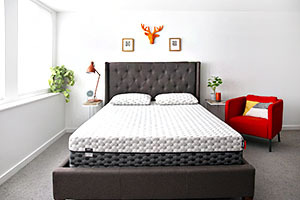 We recommend the best memory foam mattress for all types of sleepers. If you like a firm bed, the Layla Mattress firm side is the best of both worlds. 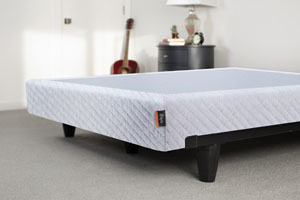 The dense memory foam delivers the firm surface you love, but still treats your body with care. Raise your hand if you love waking up in a cold sweat like clockwork at 2 am. If your hand is still down, you’re not alone. Staying comfortable all night means you wake up ready to face the day. Cooling beds like the Layla Mattress are designed to pull your body heat away while you rest. Our copper mattress attracts heat like a magnet and keeps you cool all night long. If you’re looking for the best memory foam mattress, copper-gel infused foam is the way to go. A copper cooling bed also has antimicrobial qualities. No matter how long you sleep on the same mattress, it may help get rid of the common germs that build up in traditional mattresses, including many bacteria and viruses. Heat-trapping mattresses and toppers don’t have enough air circulation or the right materials to keep you cool. Traditional, heat-trapping mattresses cause you to sink too far down and keeps unwanted hot spots on your body. This can even be true with regular memory foam! Even when you’re working with the best memory foam mattress materials, you need some air circulation and just the right blend of softness and firmness at play. Can you find this in a mattress with a single, solid core? Or do you need multiple layers to pull it off? Much like a seven-layer dip, a multi-layer mattress is carefully crafted for a delicious experience. The Layla Mattress has a layer of copper-gel infused memory foam, convoluted foam, a core layer of support foam, and then more memory foam. The combination results in incredible support and comfort. The engineering involved in a quality multi-layer mattress combines various layers of memory foam to give you the best experience possible. With a Layla Mattress, you can even flip the mattress over for a new experience created by the differing layers on each side. Single-layer mattresses can be comfortable, too. At least at first. However, over time, they often lack the support you need to get in enough REM. You are likely to sink instead of float in the long term. And that’s not a winning shot. In the next round, we look at the final four. Which feature is superior to the others? Could it be a four-way tie? 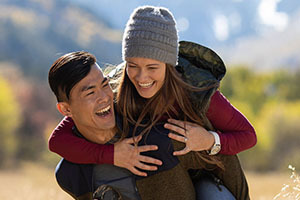 What does it mean to be the best memory foam mattress? So many questions, so little time. And just two matches remaining. Is it better to focus on the cloud-like comfort of memory foam or the zen-inducing slumber of a temperature-controlled sleep? Memory foam has an unfair reputation as being hot. In reality, our copper memory foam is the very reason you’ll get such a cool experience all night. In other words: You don’t really have to choose. The best memory foam mattress keeps you cool as you sleep so you wake up feeling rested and ready to take on the world. Good quality memory foam draws heat away from your body rather than trapping it at the surface, so you get the best of both worlds. 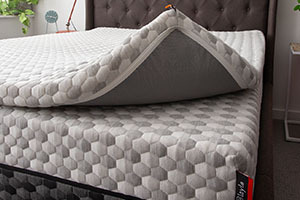 Is it more important to focus on getting a multi-layer mattress or having a top layer that conforms to your every curve? We would never ask you to choose. The Layla Mattress’s layers are the very reason it conforms to your body and never causes you to sink down in discomfort. With carefully planned out layers, especially a top layer of copper gel-infused memory foam, you are more likely to get fitful rest. The best memory foam mattress is full of top-notch layers that hug your body like they love it. Because they do. There seems to be a clear winner: the Layla Mattress. The copper-gel infused memory foam offers all the winning features from the bracket. You get full-body support and major cooling action on the best memory foam mattress. The Layla Mattress is carefully crafted with multiple layers and our memory foam is top of the line. Even better, Layla has two firmness sides. You can flip your bed over as often as you’d like to have access to a softer or firmer surface. It takes a team to win March Madness, and the Layla bench runs deep, but we’re clearly biased so don’t take our word for it, see what Layla customers think. Every team has an asset that can push it to victory when it’s in a tough spot. For Layla, our MVP is the Layla Topper. 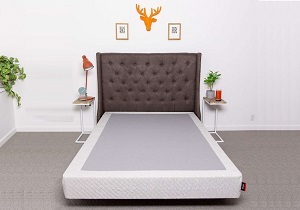 It has all the qualities of the best memory foam mattress (cooling copper and total joint support) but it can fit on top of any standard size mattress. If you want to throw a topper on your Layla Mattress, you’re only upping your level of comfort. You’re not being greedy – just smart. Who wouldn’t want to sleep on a cloud on top of another cloud? But you can also use our copper-infused mattress topper on a traditional mattress. 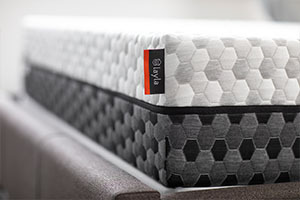 If you’re not ready to upgrade your mattress set to the best memory foam mattress just yet, use our topper to get a taste of the Layla lifestyle. We’re confident you’ll be so comfortable and cool that you’ll start rethinking your entire bedding strategy in no time. 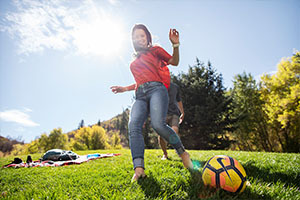 Like the real winners of March Madness, Layla Sleep memory foam mattresses have the right team, the right versatility, and the right support system to come out on top. A Layla Mattress is the best memory foam mattress you didn’t know you needed. Once it’s in your life, though, you’ll never want to bench it again.